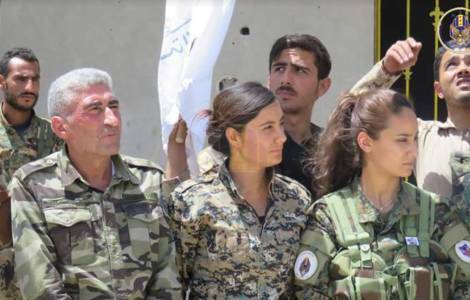 Washington (Agenzia Fides) - From now on, the United States could channel direct aid to militias and armed self-defense groups organized by Christians in the Middle East, starting from the Nineveh Plain. The news was widespread and emphasized by Clarion Project, Washington-based lobbying organization, funded with donations of tens of millions of dollars, which has as its own specific "mission" the awareness of global public opinion regarding the "dangers of Islamic extremism". According to Clarion Project, an amendment to the 2018 National Defense Authorization Act calls on Iraq to ensure defense equipment and material are getting to Sunni, Kurdish and Christian groups, including the minority groups of the Nineveh Plain, and that "the U.S. should provide arms, training, and appropriate equipment to vetted elements of the Nineveh Plain Council". A total of about $1.3 billion is budgeted for military aid to Iraq, the Kurdistan Regional Government and the Christian groups for 2018. Clarion Project claims to have contributed with its lobbying activities to the approval of the amendment contained in the bill, which will now be submitted to President Donald Trump's signature. On November 21 Ambassador Nikki Haley, Permanent Representative of the United States to the United Nations, in a meeting with UN Secretary General António Guterres, confirmed the US Administration's intention to address towards Christians, Yazids and other minority religious groups in Iraq, a portion of the funds allocated so far by the United States for development programs organized and managed by agencies linked to the United Nations Organization. This intention was announced by US Vice President Mike Pence on 25 October (see Fides 27/10/2017), in his speech at the annual solidarity dinner for Christians in the Middle East, promoted in Washington by the US organization In Defense of Christians. "We will no longer rely on the United Nations alone to help persecuted Christians and minorities", Pence said on that occasion, reporting that federal agencies "will work hand-in-hand with faith-based groups and private organizations to help those who are persecuted for their faith". AMERICA/BRAZIL - Bishops appeal for Lent: "Overcoming violence"